This trailer has undergone a full restoration from top to toe with amazing attention to detail allowing it to stand out from other trailer conversions around! 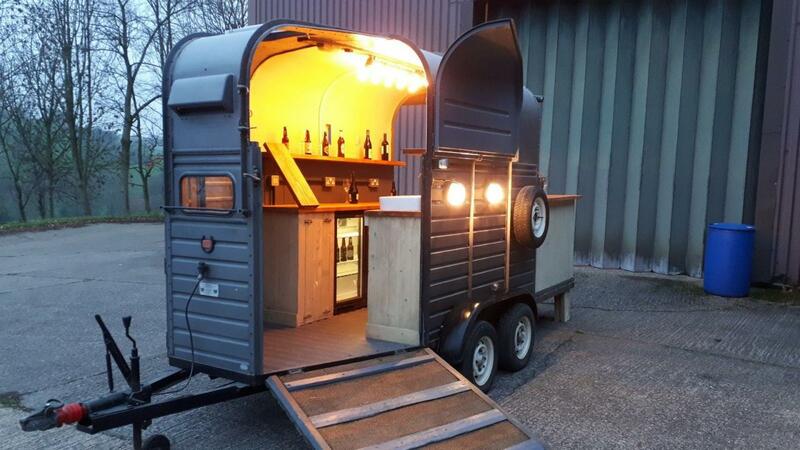 This trailers use is extremely versatile due to the addition of the bar extension to the rear - gin bar, cocktail bar, coffee box or even a catering trailer! This trailer is a gun metal colour resprayed couple years ago in fantastic condition. To the exterior two external lights have been fitted to one side to enable customers clear visibility should you wish to set up a seating area or if they wish to just stand and enjoy the ambiance. The trailers towing lights are in full working order and a brand new break away cable has also been fitted meaning the trailer is ready to be towed away! The ceiling has been painted in Sea Shell colour with a vintage industrial 10 Edison bulb light fitting providing a wonderful lighting effect. There are two handcrafted worktops which run the length of the trailer on either side, which have been carefully oiled and stained with an open/close bar hatch fitted to one end. To one side there is an under the counter two door husky bar fridge, two shelves and a small cupboard housing the mains consumer unit . Under the opposite side is a large shelving unit consisting of two shelves with room underneath to fit bottle crates on the floor , there is also a cupboard which hides away the fresh water supply and waste water container . To one side is a white ceramic sink with chrome mixer tap producing both hot and cold water on demand, this then flows into waste container which can be fitted underneath. There are four double electric sockets on top of the counters and two double electric sockets under the counters. The ramp at the front of the trailer opts for one serving area where customers can step inside whilst ordering their food/drinks and get a real feel for the quality of the trailer. At the rear a large custom built bar has been added which gives additional room and scope to serve more customers - increasing income! The rear bar has been built so it can be dismantled and stored in the centre of the trailer. The rear ramp can also be used as a simple walk up bar without the extension allowing you the option to vary the size depending on the event you are catering for. The size of the trailer allows three staff to comfortably work inside.